Barite is a mineral composed of barium sulfate (BaSO4) and is a highly sought-after commodity. It is unusually heavy for a non-metallic mineral and its high specific gravity makes it valuable in many industrial and commercial applications. Barite is the preferred weighting agent for drilling fluids in oil and gas exploration to prevent explosive release from the ground, and is also used in medications, pigments and as paper filler by the pharmaceuticals, paint and paper industries. As a result, barite is considered one of our planet’s most important ores and demand for this mineral is expected to continue to grow. Most barite ore is mined from sedimentary rock along with impurities such as quartz, sulfide and carbonate minerals, and clay. Barite recovery and processing depends upon ore purity as well as the nature of associated gangue minerals. Applications that require high brightness and high purity may require froth flotation, bleaching with sulfuric acid, and wet grinding. At ArrMaz, we have the expertise to help you recover more barite from impurity minerals, to a desired higher specific gravity with mass yield recoveries above 90%. Flotation processes are required to concentrate finely ground barite ore, utilizing rougher-cleaner flowsheet design. Barite can be efficiently floated with ArrMaz’s custom flotation reagents in an alkaline and neutral pH range, and is easily depressed in an acidic circuit. Our CustoFloat® 5919 and 5920 collectors, in particular, have demonstrated high selectivity and good recovery, and have been successfully used by the industry. 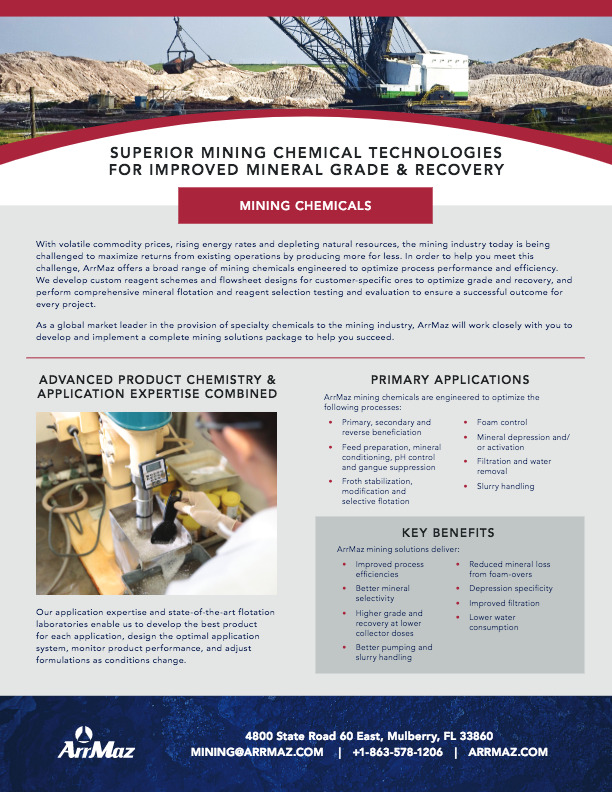 Send us your barite ore and let us custom-formulate a reagent suite and flowsheet design to enable you to mine barite more efficiently from ore deposits which may currently be under-utilized.